Teacher assistant letter of introduction. Right away this cover letter piques the reader’s interest! The opening paragraph includes Louis’ post-secondary education, highlighting his minor in Education; as well as expressing his nine years of dedicated experience as a teaching professional. As the letter progresses, it becomes very evident how versatile Louis is, explaining the work he has done with students, who are afflicted with a number of challenges and function at varying academic and social levels. After giving a brief overview of his teaching experience, we have focused on his applicable strengths and what he has to offer to the school. TIP: Your career documents, when written properly, can neutralize work-history challenges and give you the confidence to pursue the job of your dreams. 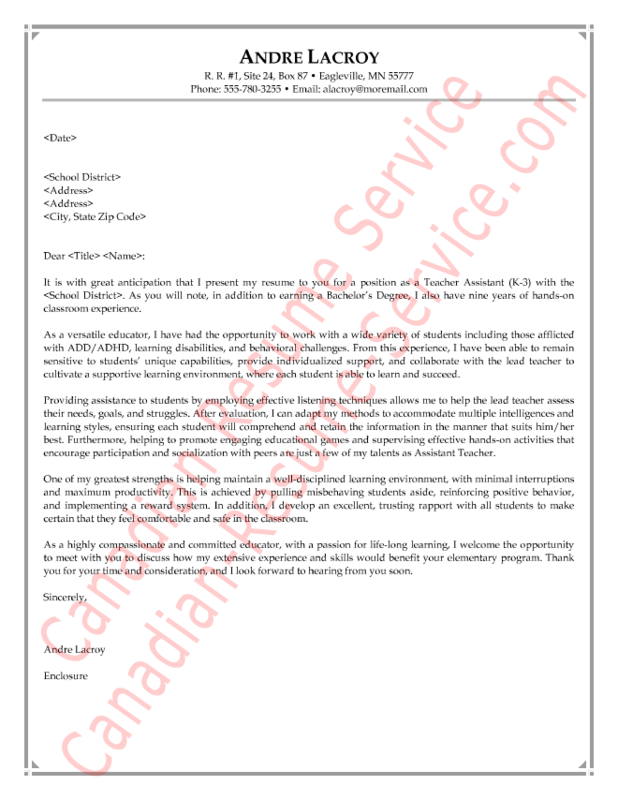 Click here or on the image to view this sample teacher’s assistant letter of introduction.